Jörg Zwicker was born in 1969 and studied Violoncello with Hildgund Posch at the University of Music in Graz as well as Viola da gamba with José Vazquez at the Vienna University of Music and Dramatic Arts. In 1990 Master Class Diploma in violoncello, in 1995 he graduated as a Master of Arts. Since 1985 he has been intensively involved with early music. In depth further studies in Baroque cello and performance practice lead him to Jaap ter Linden at Koninklijk Conservatorium in Den Haag, Netherlands, as well as to Christophe Coin at the Schola Cantorum Basiliensis, Switzerland. In 1985 he founded the special ensemble for early music "Musica Antiqua Graz", from which "Capella Leopoldina" emerged in 1992. From 1988 to 1992 he was a member of Capella Savaria. 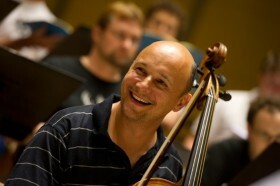 Jörg Zwicher is also a founder member of the ensembles "Musica Poetica", "Il Parnaso Musicale" and "Capella Musicae". He has worked with major conductors such as Nikolaus Harnoncourt, Nicholas McGegan, Fabio Luisi, Eric Ericson, Barthold and Sigiswald Kuijken, Konrad Junghänel, Johannes Prinz, Erwin Ortner. As a Baroque cellist and conductor he has performed with a variety of ensembles and orchestras all over Europe, the former Soviet Union, India, Canada and the USA. His work has been documented on about 40 CD recordings as well as multiple radio and TV productions. Since the fall of 1995 Jörg Zwicker has been teaching Baroque cello at the Department of Early Music at the Konservatorium Wien University, and he has been a lecturer for violoncello, chamber music and conducting at the University of Music in Graz. Jörg Zwicker is also mediator and coach (adult and personality education, mental training).